Amanda + First Cambie attempt = fail. Amanda + Second Cambie attempt = win! Yeah, that’s right. After the disastrous sundress attempt of earlier this year I was finally brave enough to take on Cambie again but with a new fabric. Rushed into wanting a cute dress to skittle around Sydney and sip cocktails in with my dear friend Jess I pulled out some more stash fabric, a pattern I’d already altered (mostly) and got stitching. Two night later- success! I had a frock. I must say I am really loving this version and I have worn this bad boy quite a few times already and it has become a firm work favourite. It looks rad solo or dressed up with tights and a cardi. I call that a win! And even better? I really like the silhouette of this a-line version and even find the back rather flattering. Yay Cambie! The fit for the skirt. I took the skirt in an each side to give a smoother finish and I’m really happy with the final silhouette. Though note to self: do not sew over pocket closings after making alterations. Oops. How well the fabric worked. I’m trying so hard to give up crazy prints and this was a definite stash buster that I originally planned as a muslin but this fabric really worked. Or at least in my head it does. Though my head is often filled with raptors trying to ride a bicycle so perhaps that is not the best judge. I’m going to look at a sway back adjustment, possibly. I feel like the fabric gathers a little in a vertical line on my lower back. I’m going to make a decision about this after a couple more wears. 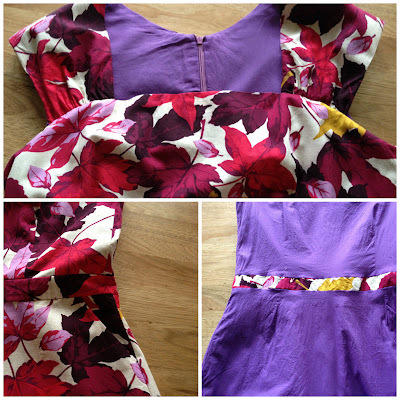 Tighten up the neckline at the front. It is a bit floppy and is generally fine for most of the day though it gets droopy by the afternoon. This is driving me a bit bonkers. I’m not sure what the best approach for this would be. Mayhaps a little interfacing or shifting the straps in a little? 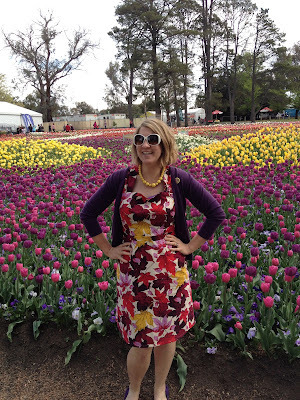 Regardless, here is Floppy McNeckline on show at the flower festival. 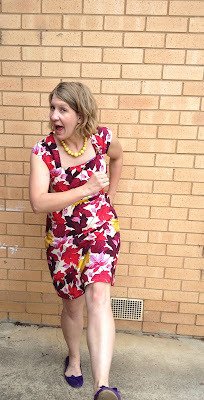 And what is better than one person doing crazy photos on my blog? Two people! 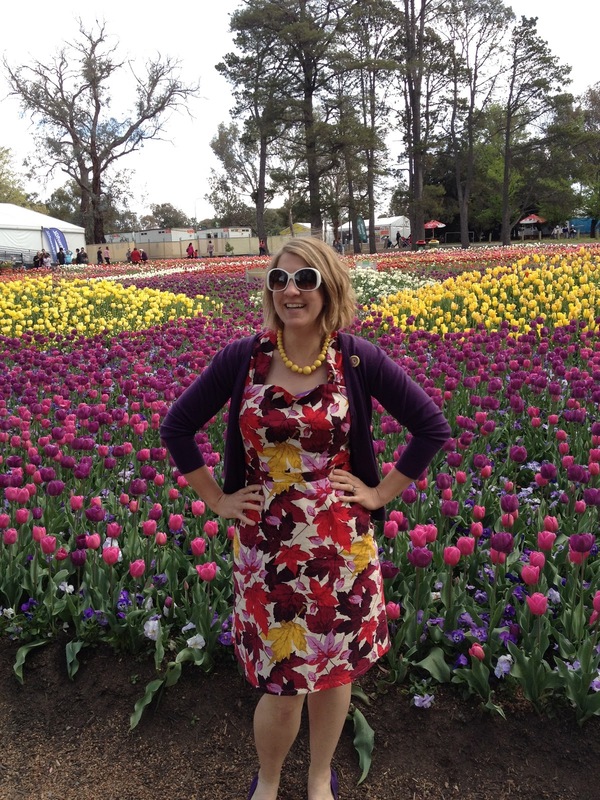 Thanks to Jess for getting her posing face on with me at Floriade. Looking sassy! Now, if you will excuse me, I have to finish cutting some pattern pieces out for my next project. I have a feeling that this one is going to be fiddly… But gosh darn it, I’ll get it done! Oh I seriously love that fabric and the insides look so neat and pretty! Bloody gorgeous. You should be very proud!! Beautiful!! Rock it, sista! Love how you got your friend in on the action too! 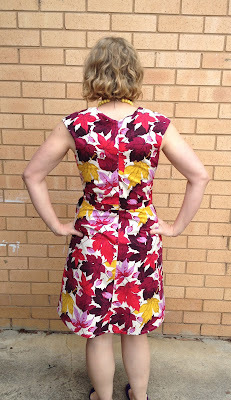 Ugh… the dreaded floppy neckline… the thought just makes me cringe in sympathy from my own neckline frustrations! Did you have this on the last version or do you think it’s fabric related? I wouldnt say this was a crazy print… it looks quite abstract from a distance, and I love the colours on you. I am in love with the brilliant colors on that fabric! Your Cambie shows them off perfectly, and it’s especially gorgeous with that purple cardigan. Great job! For the neckline, maybe add some stay tape or twill tape inside to keep it from stretching out? Yeah sucess.. The fabric it’s so autumnal I love it. Hun that dress is so pretty!!!!!!! I love floral! That photo of you in front of the flowers is gorgeous. Why thank you, Miss Clackett! Cambies can be addictive, I fear! Thanks, Suzy! I’m rather chuffed with the print. It’s a quilting fabric, would you believe? Thanks, Symon 😀 I will go pull out the gingham version and have a look. If it is on that one as well I’m thinking it is a flaw with my neckline adjustment. Thanks, Ellen! I’m thinking this is going to be the lynchpin for my autumn wardrobe next year. These colours make me think of mulled wine and scarves! The fabric you chose is so pretty. I love the vibrant colors. And the dress looks fab on you. I can’t even see the neckline bit you mentioned. Well… this is AWFULLY cute, you! This hasn’t been my favorite pattern, but I really like your version! Thanks, Mela! 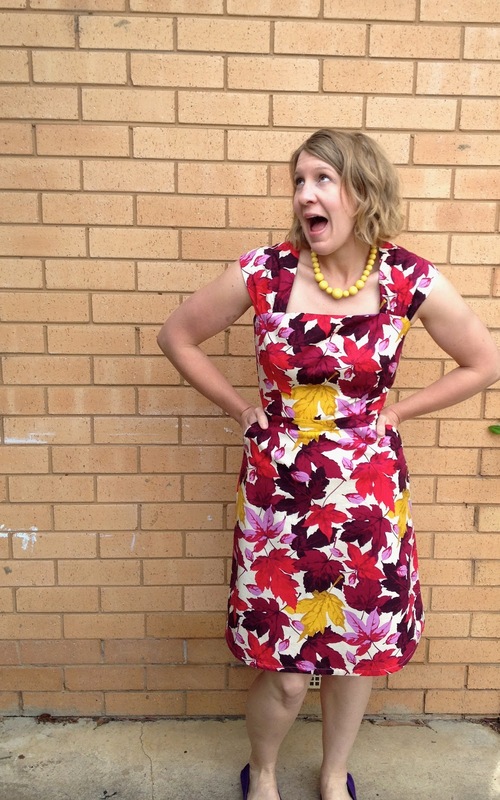 The print hides a multitude of floppy neckline sins… I have to say I want more of this fabric! Thanks, Ginger! I must admit to being very sceptical about the pattern originally but I really like it now! I got compliments at work yesterday from a whole bunch of people on it. Yay new dress! 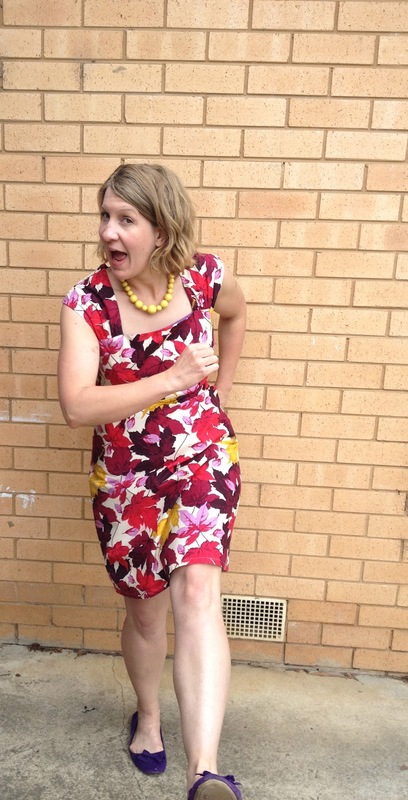 Oh my gosh…I LOVE your blog with all your silliness and goofy poses! This dress worked out really, really well and it looks fabulous on you. I can’t figure out the floppy neckline either…does it fit well under the arms? It doesn’t look bad at all though. Definitely better than the fit you’d get with ready to wear! Thanks, Shona! I figure I’m a goofball in real life why try and dress it up on line 😉 The fit is quite good under the arms- I’m thinking I will try twill tape to stabilise next time! Love the fabric and the colours! 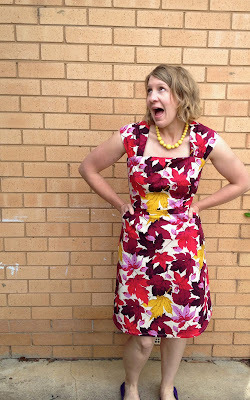 I’ve got this dress pattern but am still yet to start on a muslin… I have the good fabric all ready but ho hum, no time! I do love all these Cambies out there. Thanks, Rach 😀 My dirty secret is it is quilting cotton. Sssh… don’t tell anyone! 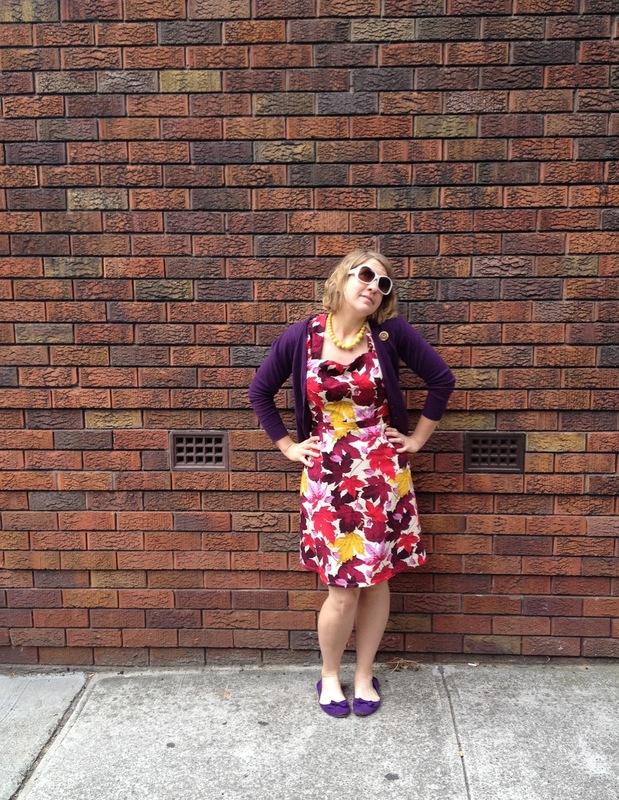 Amanda, I LOVE the purple cardi/shoes combo – I’ve been in search of a similar cardi so I can be a secret copycat since I saw your post (well, I’m in England, you’re in Oz, so I reckon we’d never turn up to the same place wearing the same thing, right?) I’ve also got the Cambie pattern on my Xmas list! I’m running behind in my blog reading, so excuse my tardiness, but I LOVE this! 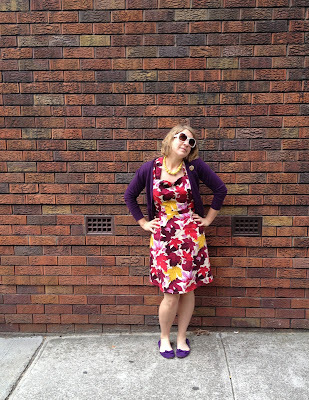 Great looking dress, colours look fab on you and the cardi combo is gorgeous!